This version of chili con carne is made with chunks of beef, a homemade chili paste, and a couple secret ingredients. A great change of pace from my traditional chili recipe made with ground beef! Behold the absolute, without question, best bowl of chili I have ever had. I first came across this recipe seven or eight years ago in Cook’s Illustrated and although it seemed like a lot of work (it IS labor-intensive), it produced one of the most amazing chilis I had ever eaten. In fact, I think I ended up making it at least three times over the course of a month because my husband and I loved it so much. 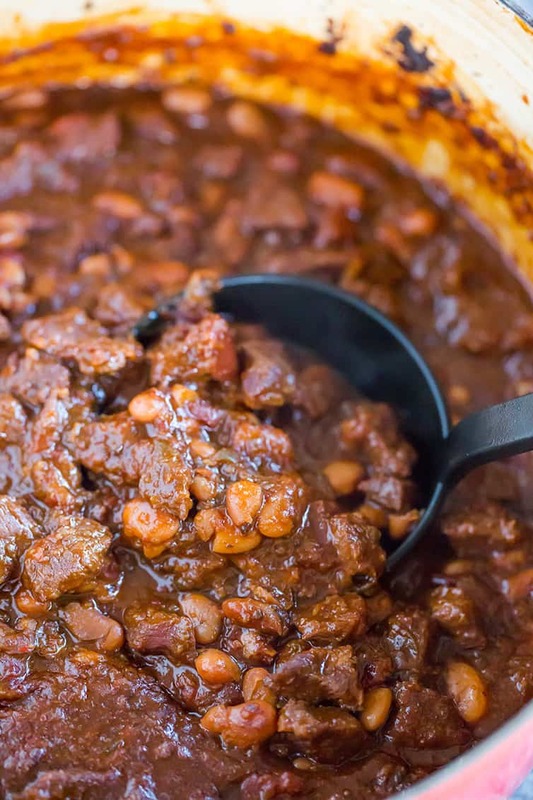 This is certainly not your average chili… it includes a few “secret” ingredients like cocoa powder, molasses and beer. It uses dried chiles ground down to make a chili powder and paste instead of the typical chili powder. And it used chunks of beef instead of ground meat. At the time, this was all very unfamiliar ground to my chili palate, but it all sounded so irresistible. I’m so glad I tried it all those years ago because it really is the most flavorful chili I’ve ever eaten. It’s bursting with flavor, and the meat becomes so tender that it melts in your mouth. What Is the Definition of Chili Con Carne? You will likely find as many definitions for chili con carne as there are people living in Texas. If you look at the Wikipedia page for chili con carne, it sums it up as a spicy stew containing chili peppers and meat, and sometimes tomatoes and beans. If you do a little more digging, you’ll find that people have very strong feelings about their chili con carne, with some proclaiming that it must always include tomatoes and/or beans, and some proclaiming that it cannot include either to be authentic. Then there’s the question of ground beef versus a cut of beef… since the technical definition is a “stew” I always err on the side of using a cut of beef cut into chunks, and I LOVE it this way! So, How Do You Make Chili Con Carne? It probably won’t come as a surprise that there are literally thousands, maybe millions, of variations and recipes that you can find out there… ground beef, chuck roast, tomatoes, no tomatoes, beans, no beans, etc. THIS recipe starts by soaking dried pinto beans, and although I think they certainly hold up better than canned, in a pinch you could certainly substitute canned beans. Next is a homemade chili paste using the dried chiles and additional seasonings (including cocoa powder! ), pureed together with some chicken broth. The first time that I made this recipe was my first time ever working with dried chiles, and I wasn’t sure if I would even be able to find them, but was pleasantly surprised when I found them at my regular supermarket. They were located in the international aisle, under the Hispanic foods. 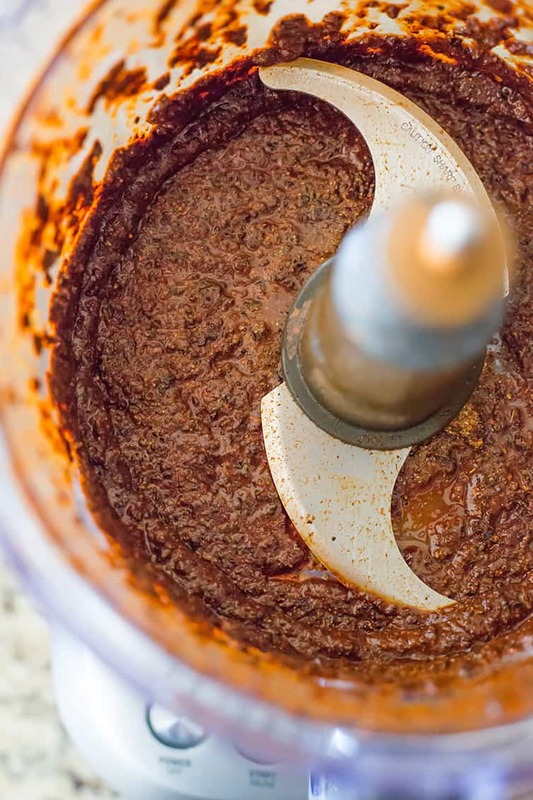 Using the dried chiles to make a homemade chili powder and paste is one of the things that really sets this recipe apart from many of the other chili recipes I have ever tried. 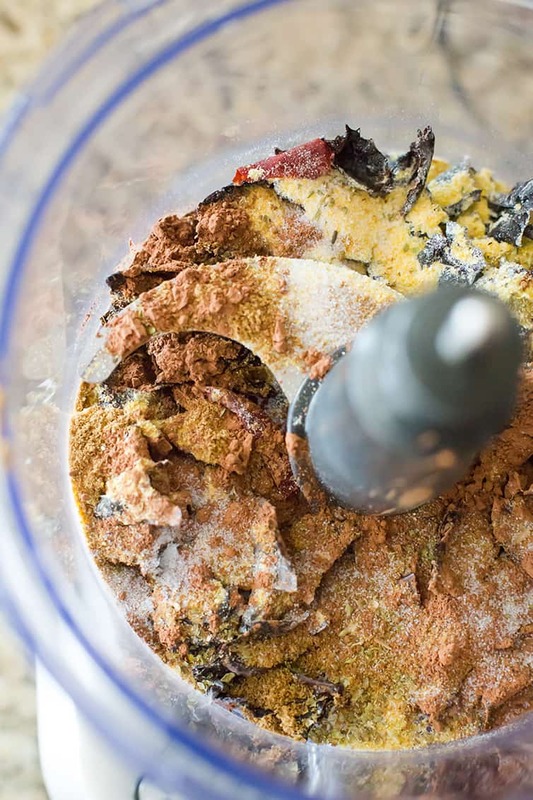 After toasting the ancho chiles, you toss them into a food processor with the arbol chiles, salt, cornmeal, oregano, cocoa powder, and cumin… voila! Chili powder! Then you slowly drizzle in a little chicken broth, and… voila! Chili paste! The rest of the recipe is pretty straightforward – the chunks of meat are seared and added to the chili paste, beans, onions and jalapeños, along with additional chicken broth, beer and diced tomatoes. It is cooked in the oven for a couple of hours, and then you’re ready to dig in! If you are in a pinch for time, you can substitute two cans of pinto beans, drained and rinsed. The recipe calls for blade steak, but I always use chuck roast when I make this; for me, it’s always the winner when making stew-like dishes because it holds up so well to long cooking times. You can also substitute regular chili powder and ground cayenne pepper in place of the dried chilies (quantities in the recipe notes below), but the consistency and texture of the chili will be slightly different. While the recipe calls for cooking this in the oven, you can do a low simmer on the stove until the beef is totally tender, at least 2 hours. 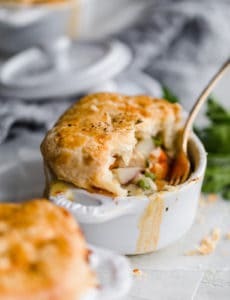 I have not attempted to adapt this to a slow cooker, but if you want to go that route, assemble it as you would according to the recipe and instead of placing it in the oven, stir everything together in the slow cooker. Low for 6 to 8 hours should work, although you may want to crank it up to high and take the lid off to let it thicken a bit at the end. 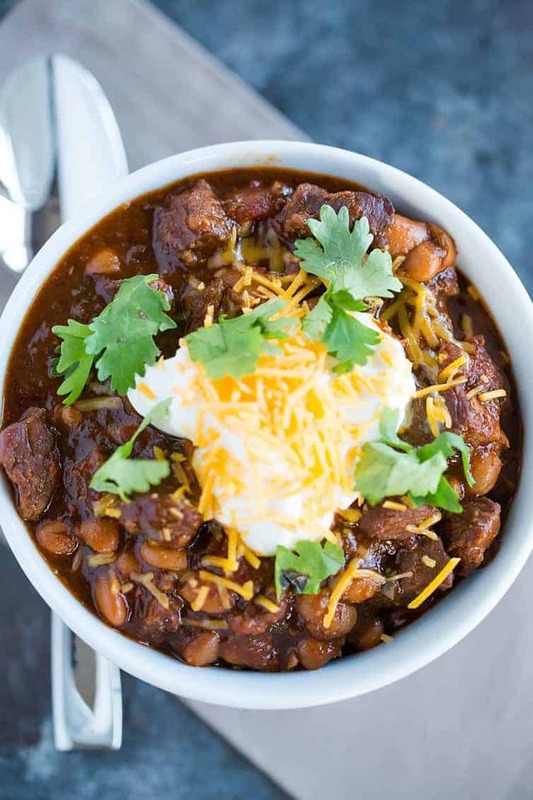 You can make this chili up to 3 days in advance of serving it (many chili con carne connoisseurs swear by cooking the chili and then letting it sit in the refrigerator overnight so that the flavors can intensify). Re-warm on the stovetop over low heat before serving. If the chili appears to thick, you can thin it out to the desired consistency with some additional chicken broth. The recipe calls for using 2 to 4 arbol chiles; I used two and I think it gave the chili a medium level of heat. If you’re sensitive to spicy foods, you may opt with one, and if you like things really, REALLY spicy, then you can up the amount! And of course, cornbread on the side! 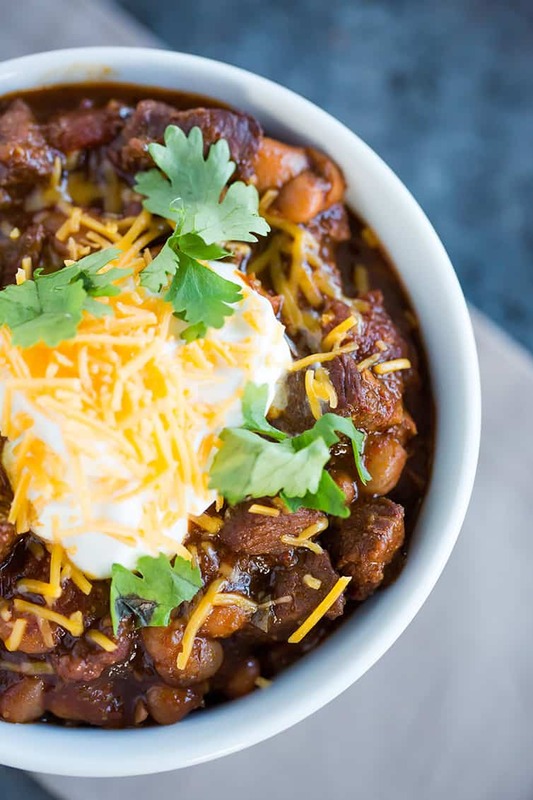 This certainly is not a fast, whip-it-up-when-I-get-home-from-work type of chili. This is a hunker down on a rainy or snowy Saturday and make this for a cozy night in. It’s time-consuming, but if you can make the time for it, it’s absolutely worth every minute. Plus, you could make a big pot over the weekend and then freeze it in portions for a rainy day, so to speak. 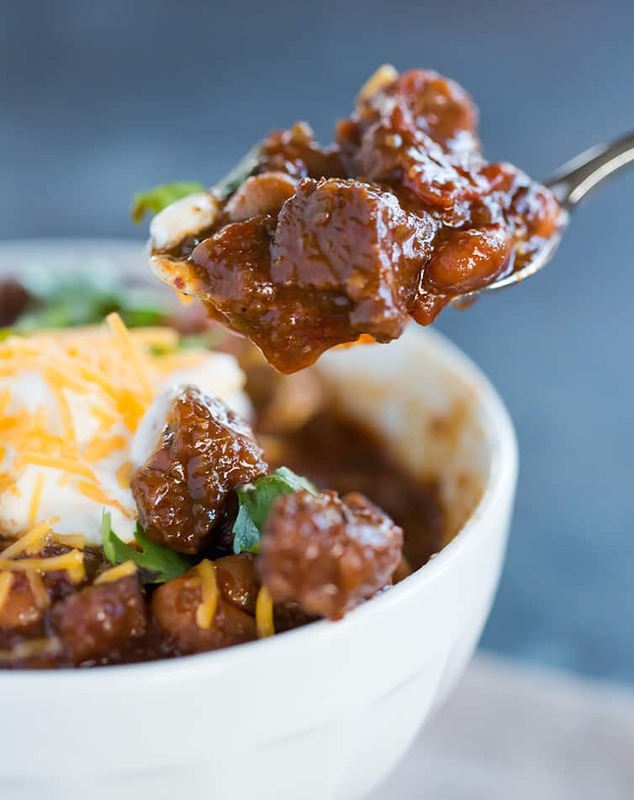 Although I don’t make this chili recipe as I do others, it’s by far one of my two favorites and has an unbelievable amount of texture and flavor in every bite. These cold winter days are a perfect opportunity to give it a try! This version of chili con carne is made with chunks of beef and a homemade chili paste. A great change of pace from chili made with ground beef! Combine 3 tablespoons salt, 4 quarts (16 cups) water, and beans in a large Dutch oven and bring to a boil over high heat. Remove the pot from heat, cover, and let stand 1 hour. Drain and rinse beans well. Rinse out Dutch oven. Adjust oven rack to lower-middle position and heat oven to 300 degrees. Place ancho chiles in a 12-inch skillet set over medium-high heat; toast, stirring frequently, until flesh is fragrant, 4 to 6 minutes, reducing heat if chiles begin to smoke. Transfer to bowl of a food processor and cool. Do not wash out skillet. 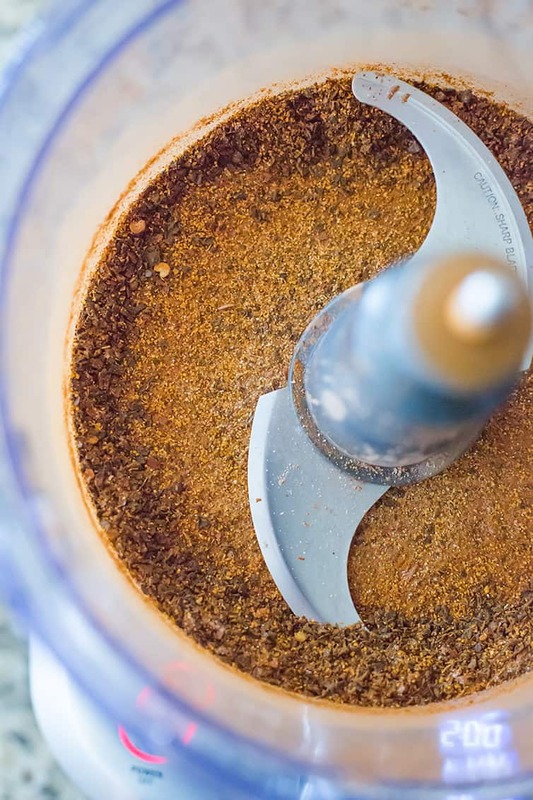 Add árbol chiles, cornmeal, oregano, cumin, cocoa, and ½ teaspoon salt to food processor with toasted ancho chiles; process until finely ground, about 2 minutes. With the processor running, very slowly add ½ cup broth until a smooth paste forms, about 45 seconds, scraping down the sides of the bowl as necessary. Transfer the paste to a small bowl. Place the onions in the now-empty processor bowl and pulse until roughly chopped, about four 1-second pulses. Add the jalapeños and pulse until the consistency of chunky salsa, about four 1-second pulses, scraping down the bowl as necessary. Heat 1 tablespoon of vegetable oil in the large Dutch oven over medium-high heat. Add the onion mixture and cook, stirring occasionally, until the moisture has evaporated and the vegetables are softened, 7 to 9 minutes. Add the garlic and cook until fragrant, about 1 minute. Add the chili paste, tomatoes, and molasses; stir until chili paste is thoroughly combined. Add the remaining 2 cups chicken broth and the drained beans; bring to a boil, then reduce heat to a simmer. Meanwhile, heat 1 tablespoon of the vegetable oil in the 12-inch skillet over medium-high heat until shimmering. Pat the beef dry with paper towels and sprinkle with 1 teaspoon salt. Add half of the beef to the skillet and cook until browned on all sides, about 10 minutes. Using a slotted spoon, transfer the meat to the Dutch oven. Pour off any liquid in the skillet into the sink and return to the heat. Add ½ of the bottle of lager to the skillet, scraping the bottom of the pan to loosen any browned bits, and bring to a simmer. Transfer the lager to the Dutch oven. Repeat with the remaining tablespoon of oil, steak, and lager. Once the last addition of lager has been added to the Dutch oven, stir to combine and return the mixture to a simmer. Cover the pot and transfer to the oven. Cook until the meat and beans are fully tender, 1½ to 2 hours. Let the chili stand, uncovered, 10 minutes. Stir well and season to taste with salt. You can substitute a 4-pound chuck-eye roast, well trimmed of fat, for the steak. I recommend wearing gloves when working with the dried chiles; if you don't be sure to wash your hands well immediately after. 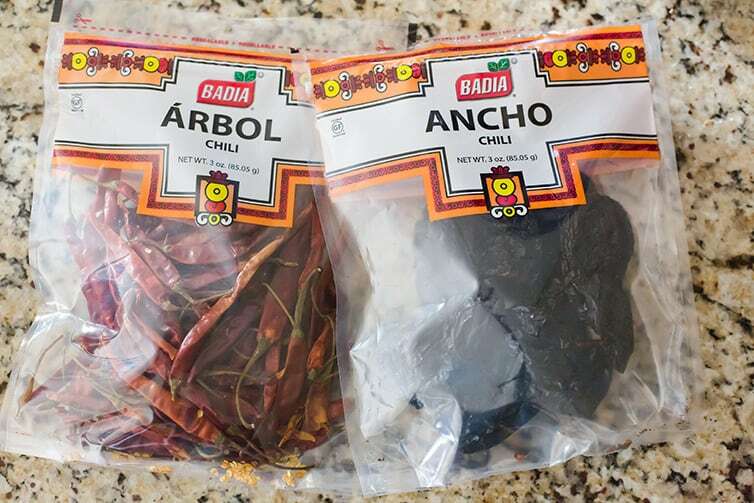 If you don't want to use dried chiles, the anchos and árbols can be replaced with ½ cup chili powder and ¼ to ½ teaspoon cayenne pepper, although the texture of the chili will be slightly compromised. Condiment ideas: diced avocado, chopped red onion, chopped cilantro, lime wedges, sour cream, and shredded cheese. 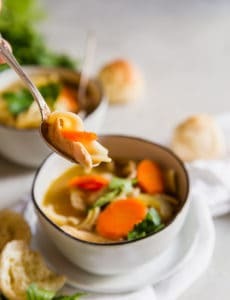 You can make this up to 3 days in advance; refrigerate covered and re-warm over low heat, adding chicken broth to loosen the mixture if necessary. This recipe was originally published on October 27, 2011. I made this yesterday for the first time. While it was labor intensive, it was absolutely worth it! It was delicious! Even my 10-year-old gobbled it up and he’s never liked chili. It was even better today as leftovers! Next time I’m going to try making it a day in advance. I made it according to the recipe, but I couldn’t find dried arbol chiles anywhere, so I used 1/2 tsp ground arbol instead. I kept the rest simple and served it with cornbread, which I made while the beans were soaking, but the chili was the temperature of the sun when it was done cooking, and I could have easily popped the bread in the oven then, too. Thanks for the recipe!! We made this over the weekend with New Mexico and Adobo dried chilies, because those were the only varieties I could find in my little town of Juneau, Alaska. This chili was yummy! My kids each had seconds. Thank you for a great new chili method. We will be having this again. I made this chili over the weekend and it is TO DIE FOR! It is a little labor intensive, but it is so worth it! I served it with cornbread, avocado, diced red onions, cheese, cilantro, homemade horseradish cream and sour cream as toppings. I also used two arbol chillies and it wasn’t overly spicy at all. This fed a crowd! Thanks for sharing! While this is a very flavorful chili, it is super rich. It is so strongly flavored, it became difficult to eat on its own. Perhaps it would be better as a chili mac, with the pasta cutting some of the richness. This sounds interesting, but I was thinking, “Eh, too much work.” Then I saw the final picture with the spoonful of chili and you got me. Now I’m thinking it isn’t any more work than making a batch of bread. However, I dislike the flavor of all kinds of alcohol, and most especially beer and wine. For things like beer bread, I have found that ginger ale is an excellent substitute. I’m not so sure that would be a good substitute here. What do you think? Thanks for sharing the recipe and your fabulous photos! Hi Elaine, It is a labor of love, but much like bread, the end product is totally worth it! As for the beer, you can’t taste it at all; just helps to really enhance the flavor of the beef and sauce. I actually just made this chili the other day. I LOVE the Cook’s Illustrated books and this was in the Top 100 Essential Recipes. I’d only ever had chili with ground beef prior to this and loved it with the chunks of meat. It was my first time having chili without ground beef too; so different and amazing! I haven’t seen the Top 100 Essential Recipes; I’ll have to check it out! Hi Karin, It’s from the same area of the cow, but blade steak and chuck roast are definitely different cuts of beef. There is another cut known as blade roast, which you might be thinking of; blade steak is much like a flat iron steak, and is a little leaner and often used in stir fry, tacos, fajitas, etc. Oh, I’m sorry for the way I stated that. I wasn’t referring to the steak vs roast part. Just the chuck vs blade. In Canada, a chuck steak/roast is just a different name for blade. If i use chili powder and leave out the cayenne and leave out the jalapenos – this won’t be hot spicy right? I am NOT a hot spicy (in a food sense anyway lol) girl. I like tasty with a teeny zing, don’t like heat. Do you think I could double this recipe in an 8 qt pot, or am I better splitting it into two 5 qt dutch ovens? Hi Abbey, I would probably split it… I used a 7.25-quart Dutch oven and I don’t think there’s any way you could double it in something just slightly larger. It does cook down a bit, but it would probably be right to the top to start off, so I’m not sure if it would affect how well it cooked.